The single line customer testimonal we received from our customer, Peter, when he got his email that his iPad was shipping back to him. This brings up a great point that I don’t talk about too much…but monthly we repair thousands of devices for customers and all goes to plan. Our process works, our customers are happy for it, and we get to repair/service another day. Thank you Peter for that awesome email. That kind of thing makes the world a better place. It was a great start to my day…TGIF! One Million Blog Reads – it’s just around the corner! Good morning, thanks for checking out the blog today! We are finalaizing preparations now for the biggest discounts that you’ve ever seen, and we will have lots of fun at each of our locations on this momentus day. I have so many stats, so much data, and have had so much fun being a professional blogger that it’s really exciting to know that soon my blog will reach the 1 Million mark and I’m just going to share my excitement and thanks to everyone. So the big day is coming…the “Mission Repair Million Celebration”…we get about 10,000 new readers each month, so at this pace sometime in October we should be there as I calculated earlier in the year. It will happen when it happens, but rest assured that I’ll be right here to share in the big day. Heat Wave…and a Coupon Inside! It’s been an interesting start to the year as the weather in Kansas City has been strangely rainy. It seems like every weekend that I have a chance to take the boat out, it’s been raining. That’s all changed and this week there’s an official “heat wave” coming through the Midwest and a “heat advisory” that extends until 9:00pm tonight here in Kansas City. When I walk outside from an air-conditioned building it takes about 30 seconds for my sweat glands to kick it into overdrive. Yesterday it was 96 degrees F, but it felt like 105 degrees according to the heat index. Since it’s so humid in this area, the actual temperature never seems to be relevant. The “feels like” temperature is what I always hone into when watching the news! Today is nearly the same. So if you brave it out to head into one of our locations we’ll reward you for doing so! Heck, today is a perfect day to visit our Colorado Mission Repair, it’s only 92.5 degrees F – but get this – because it’s so dry in Lakewood, Colorado the “feels like” temperature is actually only 91 degrees. Yeah, that’s awesome “mountain air” for ya! Again, if you head into one of our shops today, we’re offering a $10 off discount on any repair that’s over $50 now through the end of the week, Friday 7/17/15 at midnight. Just enter coupon code “HOT” when checking out online, or print and bring a copy of this blog to your sales representative for your discount. Please, no discounts without a print out, and this coupon cannot be combined with any other coupon or discount, including “Got Repair” benefit prices. You don’t have to rush in. It’s too hot for that. 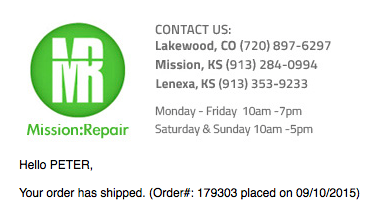 Just slowly make your way into a Mission Repair location or place your order online and we’ll be happy to extend that $10 off coupon on your next iPhone, iPod, Mac or other Smartphone repair until this Friday.